Easy drive. with some rain forest terrain. Another way of accessing the Teewah Beach from the North. Kings Bore track from permanently closed by Qld EPA with concrete posts and metal gates early 2009. There is another way around to the beach following the eastern firebreak, also known as the Pettigrews track. 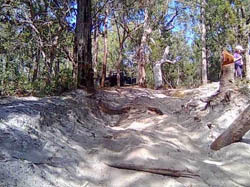 This track and the Western firebreak (also known as the Kings Bore track) intersect at Camp Milo just off of the Rainbow Beach road. King\'s Bore Track is closed but EPA/National Parks say it\'s a temporary closure. (tho\'someone\'s trashed the gate and used the track anyway) Alternative route from rainbow Beach road to Tewah Beach is still Petigrews Rd from the same starting point as King\'s Bore. Track is easy through rain forest for first 1/2 then becomes more challenging. There is one steep uphill section shortly before the junction with King\'s Bore Rd which is badly eroded. Some travellers have winched up here and damaged the trees used as winch points. There is a chicken track to the left which winds through the scrub and care is needed to not damage panels. Don\'t try is in a softroader. 23k\'s took us a couple of hours leisurely driving. A nice run. Pity it\'s used by types that give the rest of us a bad name and the EPA reason to close more tracks.